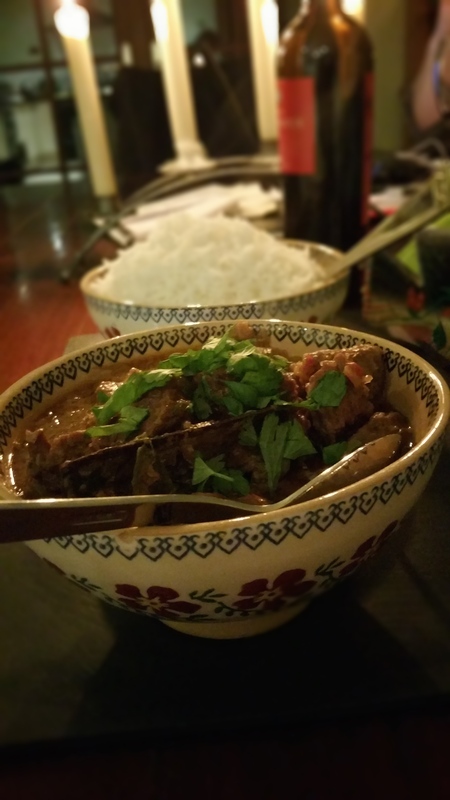 I’ve been fascinated watching the challenge set by Sinead over at Bumbles of Rice, asking folks to put up photos of their dinners during the week. The real life ones…. not the photoshopped, styled photos…. the dinners that people are actually sitting down to eat each day. I know Sinead is talking about family dinners, i.e. families with kids. ladies, how you cook separate meals for kids and adults amazes me… tis bad enough cooking dinner for 2 people!!! However cooking for two can be just as stressful, you know, we can be pulling our hair out trying to decide what to have for dinner!!! We cook every single night. 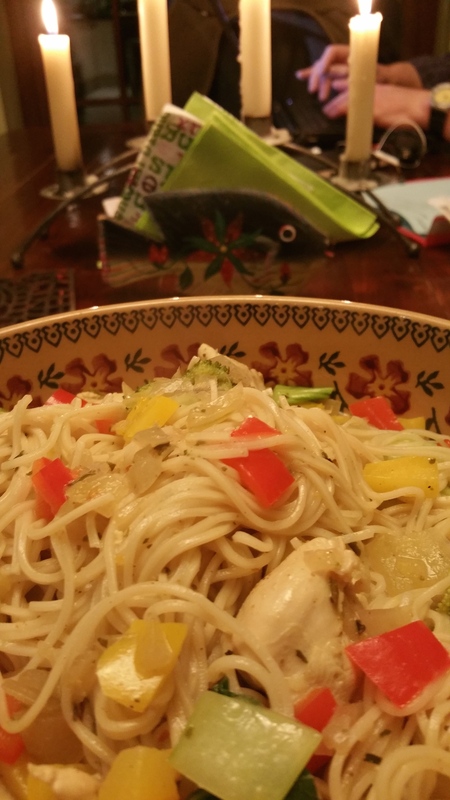 The odd night, it might be something reheated out of the freezer, but other than that it is freshly cooked. When you live 6 miles away from a (not so great) take-away that’s what you have to do. I’m trying to be a bit organised at the moment, with my 7 dinners listed at the start of the week…. just to take the pressure off, but then sometimes the old s*** hits the fan and plans have to be abandoned. So here goes folks in the spirit of sharing is caring….. here’s how our dinners worked out last week. We’d had a busy weekend, so Sunday night became our ‘kind of’ take-away night…. in that Alfie made pizza. He makes a pile of pizza bases in one go and freezes them individually for the night when no-one really feels like cooking. I make a stack of tomato sauces with different flavours when we have our own tomatoes and freeze those too! Pizzas in this house tend to be vegetarian…. Alfie makes a damn fine potato and leek pizza… and as for his aubergine and red cabbage one – to die for! It was my turn to cook. Alfie’s daughter had made Chicken Laksa for us when she visited in October and I was dying to try it for myself 🙂 Gosh, is this tasty! 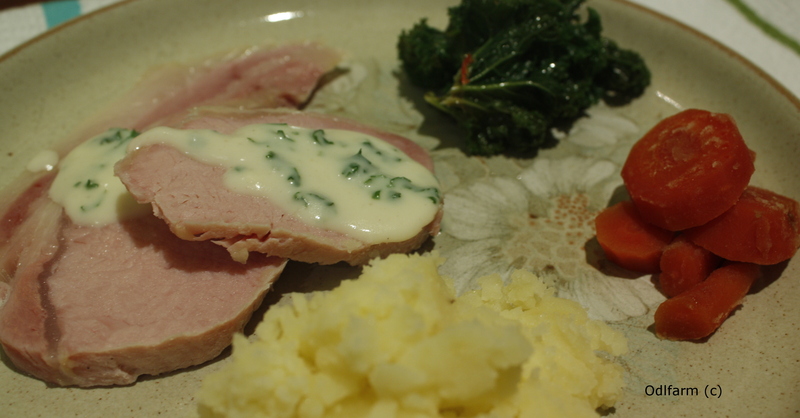 We had B&B guests who were eating with us so it was a traditional Irish dinner….. Bacon and Cabbage. Having had an incredibly early check-out : 3 am…. we were both exhausted so it was something from the freezer…. 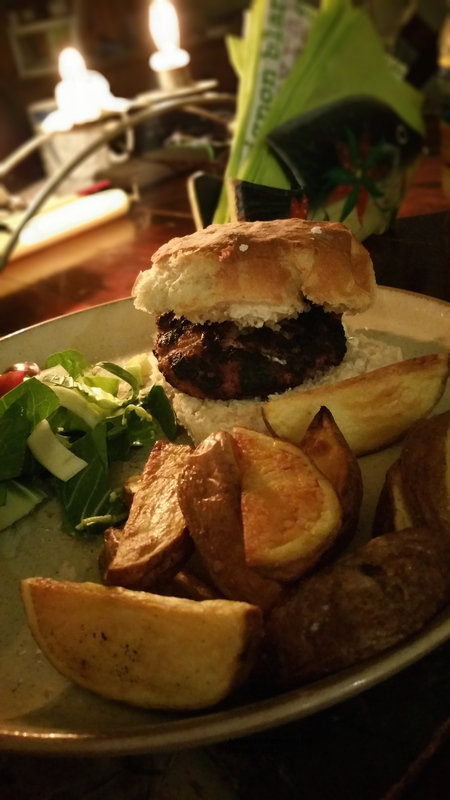 Alfie’s pork burgers with home-made chips and salad. Was another meatless day…. again a new recipe that I tried. 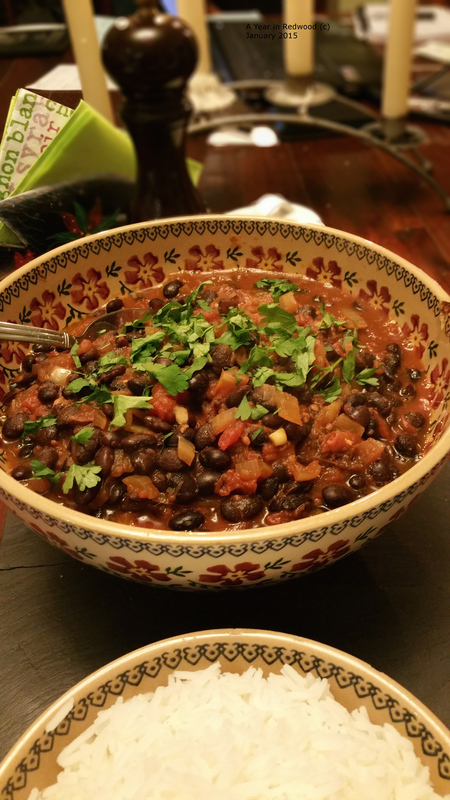 Black Bean Chilli…. very nice. Beef Malay. I love this dish and in fact, would be happy to have it every week… but that would be silly wouldn’t it?? I was in Dublin all day, so Alfie was in charge of dinner…… if you know Alfie at all, you’ll have guessed, yes…. 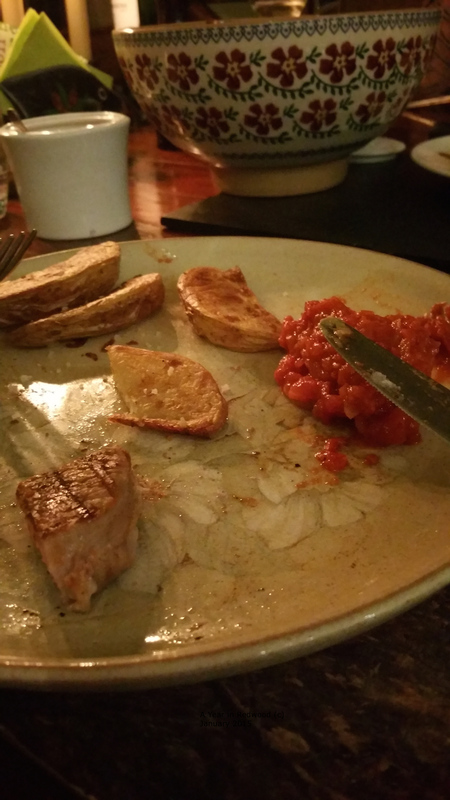 it was steak with patatas bravas 🙂 As you can see from photo, I was almost done before I remembered to take photo!!! As you can see there was a bit of lack of variety and/or balance….. chips and patatas bravas and rice on 2 nights…. but what the heck… this week will be better (not)!!! How do you do on your dinners? Everything looks lovely! It wouldnt be an irish home without a couple of days of potatoes! Might try this post myself next week – its the sort of thing I love noseying at. What a great week in dinners, I’m moving in! I rarely cook full separate dinners for the kids, they eat what we eat usually unless it’s steak or something very spicy 🙂 That laksa looks delicious. See you in the morning so… what would you like for dinner? Yes, the chicken laksa is amazing!